In the middle of the craziness of the South by South West festival in Austin Texas, Girls in Gis took main stage and rocked it like no other. On March 10, forty-six women and girls from all across Texas came together for Girls in Gis- Austin. 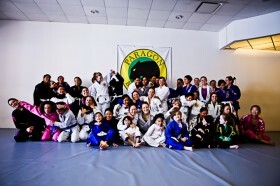 We met at Paragon Brazilian Jiu-Jitsu Austin and resident blue belt Elena Lee led the event. Elena rolled out like a pro and the fans went wild. After a warm-up, Elena demonstrated a series of arm bar and triangle submissions. Her concise attention to details resonated for a lot of girls and was a fun and informative session. As the participants executed the moves, Kat Harrison, Ashley Nguyen, Lana Hunter, Tessa Simpson, Jackie Mahler and Rebecca Varady were on deck to help those in need. No Wo-Man was left behind. We concluded with an open mat session which gave the girls an opportunity to roll with someone their size and rank. Our beloved sponsor, Defense Soap, was a part of the festivities with a rock’n giveaway contest provided by reseller Rebecca Varady. Congratulations to Whitney Neck on winning the Defense Soap goodies! We would also like to thank Paragon Brazilian Jiu-Jitsu Austin for their hospitality. Always great to work with you guys! Thank you Elena Lee for hosting and instructing at Girls in Gis-Austin. And a big huge gigantic thank you to all of you rock’n & roll’n girls for coming out and joining us at GIG-Austin! Hi, my name is G.M. Cynthia L. Thompson, I host the Girl’s-N-Gis All Female Karate College Scholarship Tournament in Chicago, Illinois. This will be my second year hosting the tournament. I would like to send you information on our tournament. Please send you mailing / email information to tkf1992@yhoo.com. We focus on Brazilian Jiu-Jitsu and the grappling arts. Thanks for your interest.